Yes, I know baseball has been going on for a month and the M’s have played two regular season games, but the real season is almost here. If you come around Pringles Park these days, preparation for the first home opener since 2005 is reaching a fever pitch. The interstate project is almost completed and today the interstate sign was added. If you have not seen it, check it out HERE. The only project yet to get started is the new HD Video Board to be installed the first of May. As a native West Tennessean it is nice to see the ballpark as alive as when it opened in 1998. 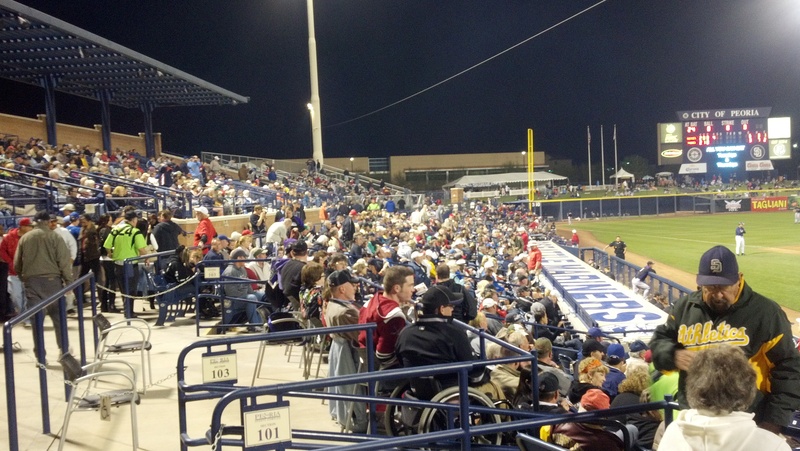 Going off reports from spring training and information you receive, the Generals roster is close to being completed. Camp will break this weekend with players flying to their respective affiliate on Monday. The Jackson players will fly into Nashville on Monday and will hop on a bus to West Tennessee for the season. 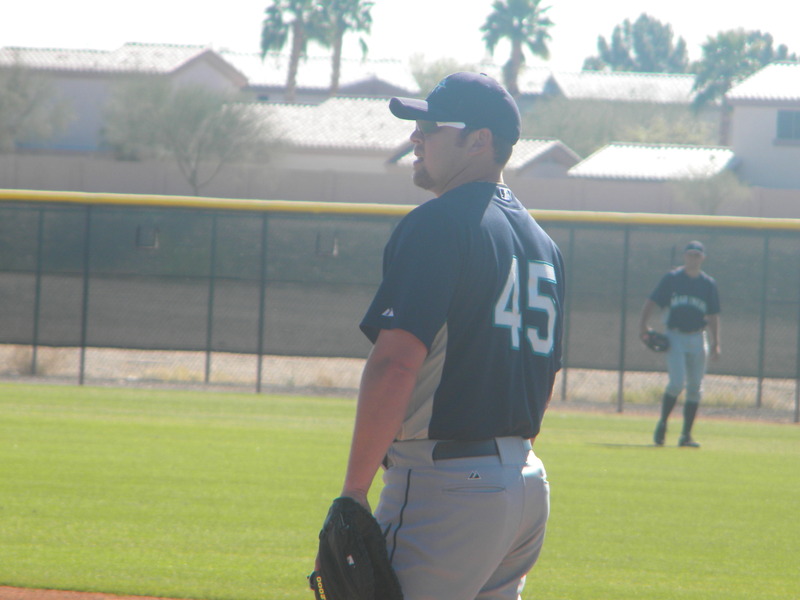 All indications continue to point towards Jackson having “The Big 3” of James Paxton, Danny Hultzen and Taijuan Walker. Rosters are very delicate and one injury could re-shape an entire team. As it stands on March 30, here is a pretty good idea of what the roster might look like. I preface this by saying again. I am not in Arizona, but only gauging on reports from recent spring games. A couple of names not on that list are Jake Shaffer and Scott Savastano. Shaffer was released by the Mariners this week according to the latest Baseball America LIST and Savastano has been playing well for the Tacoma spring team. Amazing a guy that was almost cut last spring could start the year in Triple-A. Probably two of the three catchers will head to Jackson. For Shaffer, I have never met a nicer person. He is one of the best when it comes to leadership. I hope he lands on his feet and I am sure he will. It will be interesting to see what the rotation will be if indeed Paxton, Hultzen and Walker are in it. It would appear that Brandon Maurer, Andrew Carraway and Yoervis Medina will compete for two spots. Honestly, they will all get an opportunity when promotions are made. The back end of the bullpen is easy to see. Stephen Pryor will have a strong hold on the closer role and it will be fun to watch Steven Hensley develop into his new relief role. I think it is a great move for him. Pryor also gives a nice local flavor to the team having gone to college at Tennesee Tech. Pryor had a 1.19 ERA and 6 saves in 17 games in Jackson last season. 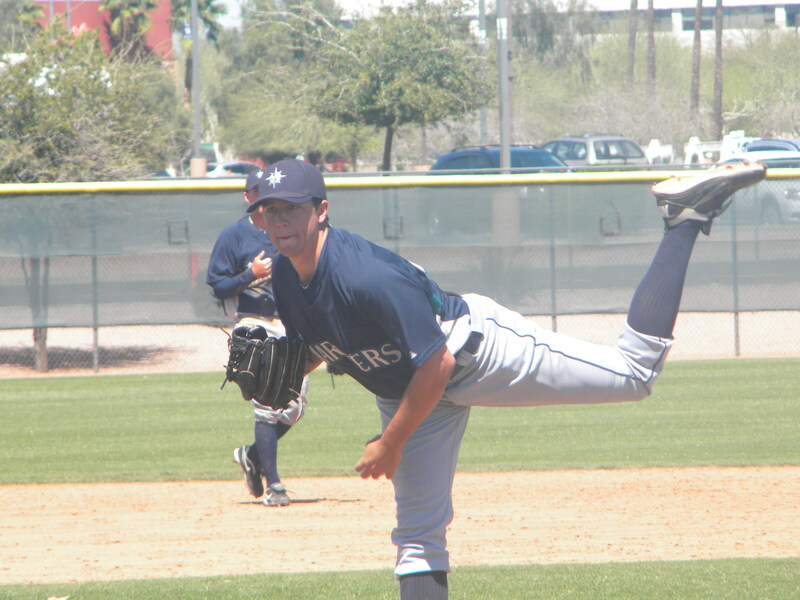 For the latest news and notes from minor league camp check out the Mariners official blog HERE. The Jackson Generals roster will be announced by the Mariners on Monday and the opener is on Thursday against the Birmingham Barons. With just 11 days before the home opener on April 5th against the Birmingham Barons, things are slightly clearing themselves a bit in minor league camp. 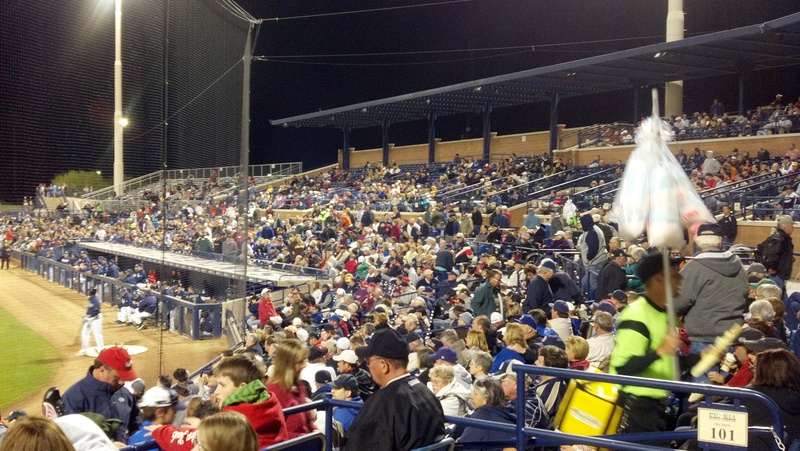 As was said to me many times on my recent visit to Peoria, this is the most crowded minor league camp in recent history. Cut days are no fun. This week several cuts were made on the minor league side. As reported by Rick Randall of SeattleClubhouse of the scout.com network, here were the cuts made this past week on the minor league side. A couple of former Generals were included. You get to know some of these guys personally and it is tough to see them go. Cooper, Kasparek and McOwen are the most notable on my end from that list, spending time in Jackson last season. James McOwen will always be known for his break-out season in 2009 with High Desert. He hit .340 with ten homers, 82 RBIs and 13 stolen basses. He had a 45 game hitting streak that year. It was the eighth longest hitting streak in Minor League Baseball history. He had just a .261 average and .665 OPS last year in 72 Double-A games. Kenn Kasparek got off to a brilliant start last year, but ran into arm problems after the first month-and-a-half. He was 4-2. with a 3.45 ERA before the injury and 1-3, with a 5.88 ERA when coming back in August. His nice start earned him a Southern League All-Star game selection. Kenn did not throw hard for his 6-10 build, but had nice command of the strike zone. Hope he lands on his feet somewhere. 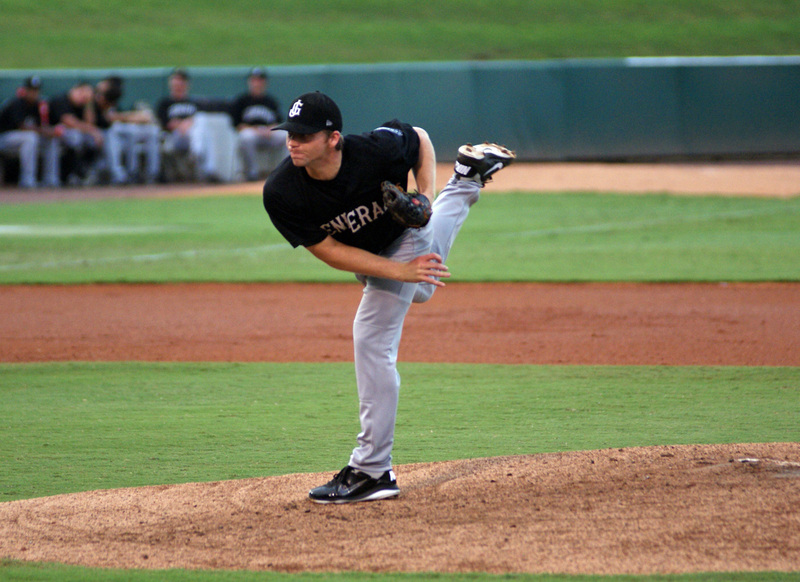 Daniel Cooper made just nine appearances in August and September after a call-up from High Desert. The former USC Trojan was 1-1, with a 4.24 ERA and one save. He walked seven and threw four wild pitches. So, how does this change my projections of the Generals roster. Connor Glassey of Baseball America tweeted this last week. So, with that said, nothing changes the top three on that list. I did replace James Gilheeney with Andrew Carraway. Hensley has converted to a reliever solely. Do not see him starting in the pen with Tacoma, but could happen. He has had a nice spring and good Fall League. Francisco Martinez has been phenomenal lately. With Vinnie Catricala likely playing third everyday in Tacoma, Martinez should start in Jackson but may not be here long. One, Catricala will be in Seattle before you know it and two, Martinez is a stud. In his last two spring games he is 5×10 with a double, triple and an RBI. Plus he hit a 2-run homer against Danny Hultzen in the intrasquad on Thursday. I would imagine Mario Martinez could be the next in line to play third base. He has looked very good as well. I replaced James McOwen with Brandon Haveman and Denny Almonte with Jake Shaffer. With Almonte and Dunigan possibly in the same lineup, that is a lot of strikeouts. 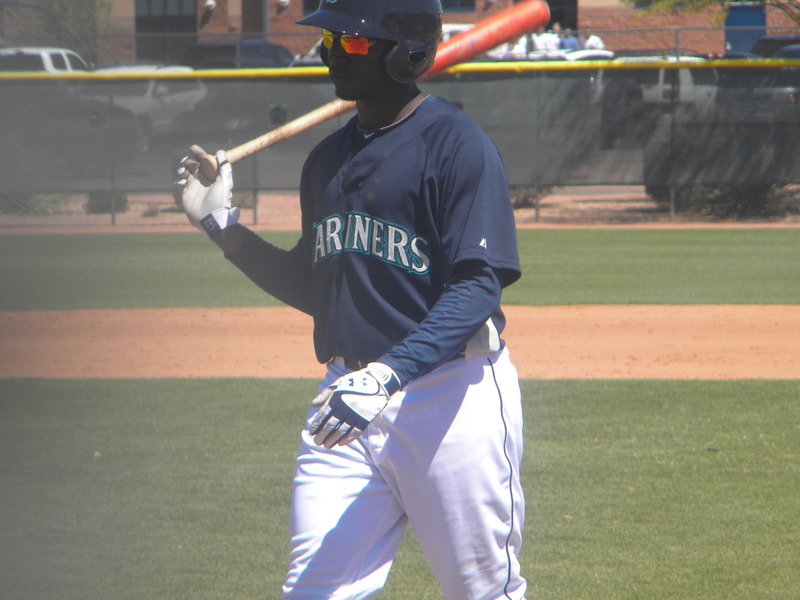 Dunigan has showed well this spring including 4×8 w/ a homer and 3 RBI in his last two spring games for Tacoma. Day three was a bit different. Spent the majority of the day on the minor league side for “Camp Day” which means the minor league teams do not play other teams, but intrasquad with each other. The AAA played AA and High A played Low A. The major league guys trickled in throughout the morning. The three-bus caravan of Mariners and staff left for the airport around 12:15pm. Each Mariner player was allowed to bring one guest on the team flight. Kevin Millwood did not make the trip because he is not scheduled to pitch in any of the games. As you see below, today he tossed a bullpen session around the minor league pitchers on a back field. The whole Japan trip is very confusing. The M’s trimmed their roster to 30 , but only 25 can be eligible for the two regular season games with the Athletics. When they return to Peoria, after reassigning or optioning guys to minor league camp, they can bring them back to play the final five Cactus League games. Told you it was confusing. The Japan trip has made things a bit more chaotic than usual I’ve heard from several people. Kevin Millwood throwing a side session. As there were more cuts today I always think of the movie Major League, when Ricky Vaughn said that “you have died and gone to the minors”. While it is not that bad, it is a lot different. Guys like Vinnie Catricala, Jesus Sucre and Mike Wilson had the day off and will join minor league camp Friday. Adam Moore caught Millwood’s bullpen session and looked to not be affected by the wrist injury. Below are the intrasquad lineups. Jackson won the scheduled 11-inning intrasquad 4-3 and here are some of the highlights.This game was played at Field 3, which as you see in the picture below is nothing more than a well manicured city league field. James Paxton started the game for Jackson and went 4 innings. He allowed a run on 4 hits, while striking out 6 and walking just 1. Paxton lived around the 92-95 mark and his curve ball was pretty devastating. He struck out the side in the 4th, including a curve ball strike three to Chih-Hsien Chiang that had him bailing out. Forrest Snow allowed 3 runs in 4 innings of work, but by my count only 1 was earned. Johermyn Chavez dropped a fly ball that allowed a run to score and an errant throw by Eric Campbell plated another. Danny Hultzen was shaky in his first inning, allowed a double to Nick Franklin and then a 2-run home run to Francisco Martinez. Martinez had a pair of knocks in the game and so did Franklin. Hultzen settled down and struck out 7 in his 4 inning outing, walking none. Hultzen sat around the 94 mph mark and was told he hit 97 a few times. Wow…Impressed with his change up. He fanned Trayvon Robinson on 3 pitches and 2 were change ups. On the fastball Robinson cracked his bat and was not too happy about it. Impressive. Never got rattled. Brian Sweeney, Jose Jimenez and Oliver Perez tossed 2 scoreless innings each for Tacoma and Steven Pryor allowed a run in the 11th. Wrapping up the day for Jackson was Daniel Cooper and his only flaw was a solo homer to Edilio Colina. Subs in the game of note were a few former Jackson players like Jake Shaffer, who had a single off of Oliver Perez and James McOwen who was 0-for-2 in the game. Mario Martinez reminds me a lot of Francisco Martinez. Mario had a double in the game. Serving as bat boys were former Jackson pitchers Mauricio Robles, Steven Hensley and Brian Moran. None were as good as Scott Patterson a few days before though I hear. The high sky affected several fly balls. Out here in the “Valley of the Sun”, the term “high sky” has a different meaning. Especially since I have not seen a cloud in 2 days. The best way to describe minor league camp is mass chaos. It reminds of travel ball when I was young. You play at a complex of fields and rotate from one to the other. The difference of course is these are professional players. It is something you really have to see to understand. You see a lot of friends and family taking in the activities. The attendance at the game today was probably 20 though. After the day ended at Mariners minor league camp, I decided to head over to the last few innings of the Padres/Indians game. After the game I had a chance to catch up with former Diamond Jaxx manager Phil Plantier. He is now the hitting coach for the San Diego Padres. Below are a few more pictures of day 3 in Arizona. Cick on each picture to make larger. Flying back to Tennessee Friday morning, but coming back with a bit of a sun tan!. Been a fun week. Day two in camp was a lot of fun. You know that feeling when you go somewhere for the first time and you have no idea where you are going? Yeah, that was me a lot today. But, when I found where I was going it was an absolute blast. The Mariners have been incredibly courteous and hospitable. Have a new found respect for the Media Relations Staff for the Mariners. They have spring training down to a science. Started the day at 9am over at the minor league fields. Players were spread over 4 fields mainly by class. Those levels really mean nothing right now. Tomorrow, minor league camp will look a lot different with cuts being made from big league camp to get the roster down to 30. The first few voices I heard while walking up were High Desert pitching coach Tom Dettorre and Jim Pankovits. Pank is still managing the Triple-A team, but tomorrow I would imagine Tacoma manager Darren Brown will be down from big league camp. Daniel Carroll and Mickey Wiswall were both with the Triple-A group today. The Triple-A team played the White Sox Triple-A team in Glendale and while I do not know the final score, I was told they were beat up pretty good. 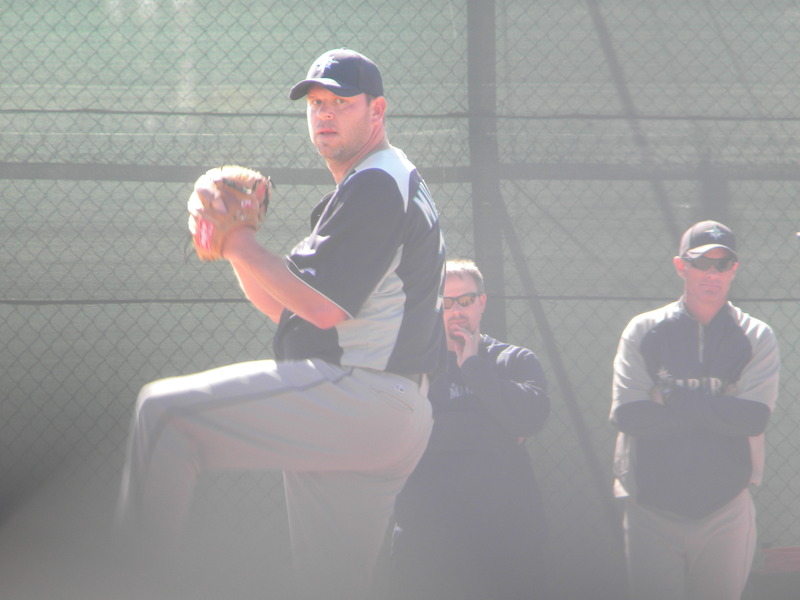 Lefty John Danks, who more than likely is the opening day starter for the Sox made the start and threw 96 pitches. He did make a mistake to catcher Ralph Henriquez who took him deep. According to Tribune writer Mark Gonzalez Danks finished with four runs allowed, three earned, in six innings while walking one. Evidently the White Sox prefer not to match MLB starters against teams they will face during the regular season so they sent minor leaguer Eric Stults to face the Mariners in Peoria. 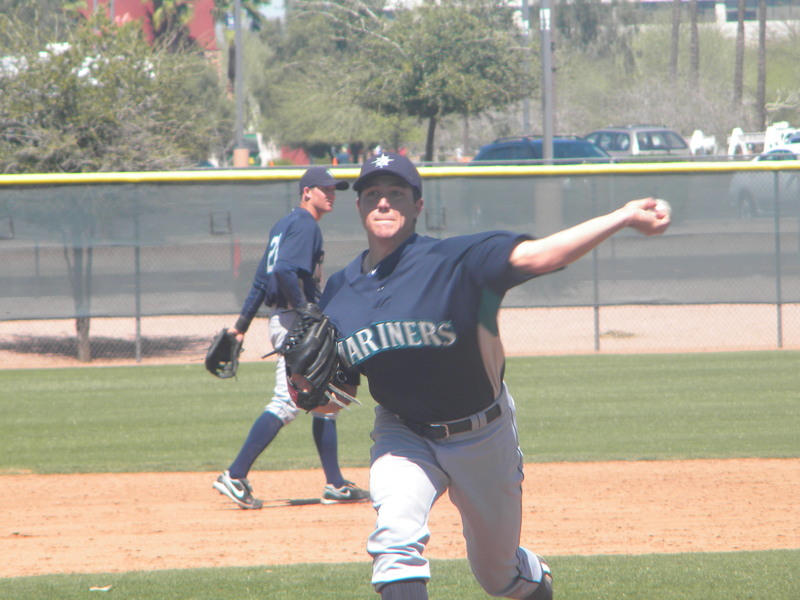 Mauricio Robles, Philippe Valiquette, Bobby LaFromboise and Brian Moran pitched for the Triple-A Mariners. Found out that Kenn Kasparek had been released from his minor league contract. He battled injuries, but spent most of last season in Jackson last year. Highlights from Tuesday’s game included 3.0 shutout innings from Erasmo Ramirez in the AAA game…Nick Franklin went 3-for-4 with 2 triples and 4 RBI for Tacoma and Julio Morbon went 5-for-5 with 2 doubles, one triple and 2 RBI for High Desert. After minor league practice I headed over to the major league stadium and took in the Mariners game with the White Sox. 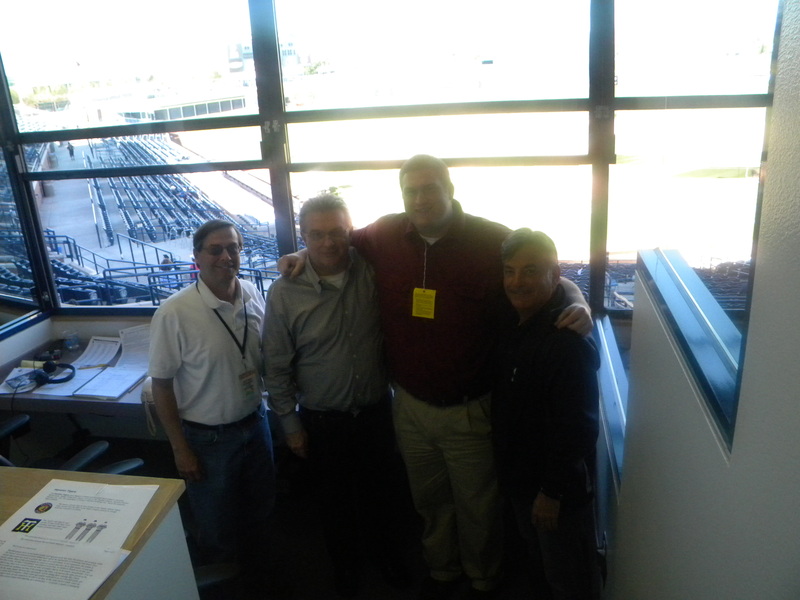 Was able to join Rick Rizzs and Ken Wilson on the Mariners Radio Network today. Got a little taste of the show, and being able to be on the air with those guys was pretty awesome. Can at least check a major league broadcast off my bucket list. R to L Rick Rizzs, Chris Harris, Ken Wilson and producer Ken Levine. Was able to catch up with former Generals trainer Matt Toth who is now with the major league team. Caught up with a lot of the former Jackson guys in major league camp. Steve Delabar had not seen his special on HBO yet. Oddly enough Delabar’s locker is right next to Tom Wilhelmsen’s. We had a nice conversation about how their should be dual HBO feature combining both their stories and how I could narrate it. Funny stuff. Vinnie Catricala was getting his bags packed to head over to minor league camp. He did not make the 30-man roster heading to Japan. He was obviously disspointed, but understood it is part of the business. Vinnie had another hit in today’s game against the White Sox. Dustin Ackley told me he was more comfortable this year than ever before. Said he finally knows what his roll is and how it will not change as long as he produces. Everybody was dreading the 14 hour plane ride to Japan. Felix Hernandez, Jason Vargas, Hector Noesi, Blake Beavan and Kevin Millwood will be the opening day rotation, says Manager Eric Wedge. That leaves Erasmo Ramirez on the outside looking in. But, talking to a few people today, he has impressed this spring and will get a shot. Triple-A broadcaster Mike Curto says Erasmo and Matt Fox will probably open in the Tacoma rotation, leaving only three spots. Not even going to speculate but Oliver Perez might be number three. Was amazed today at the amount of Japanese media. I guess I expected it, but I would guesstimate there were more Asian media than American media covering today’s game. Was interesting at how one guy will translate quotes in the press box and the rest will listen and record him. Tomorrow will be a camp day for the minor leaguers which means no game, but in order to get guys innings they will intrasquad. AAA vs. AA, etc. The major league guys head to Japan tomorrow and according to Mariner notes, buses are scheduled to roll from Peoria at noon, with wheels up out of Phoenix Sky Harbor Airport at 1 pm…the traveling party is scheduled to arrive at Narita Airport at 6 pm on March 23…Seattle will playa pair of exhibition games against the Hanshin Tigers & Yomiuri Giants, with the records not counting towards Cactus League standings or the regular season…Seattle will then be the visiting team for two games vs. the Oakland A’s in 2012 Japan Opening Series. Below are some pictures from today’s major league game and then minor league camp photos under it. You can click on each image to make them larger. Day one in Arizona was mostly a travel day, but was able to explore the area quite a bit. One of the greatest parts about this trip is my dad is along. 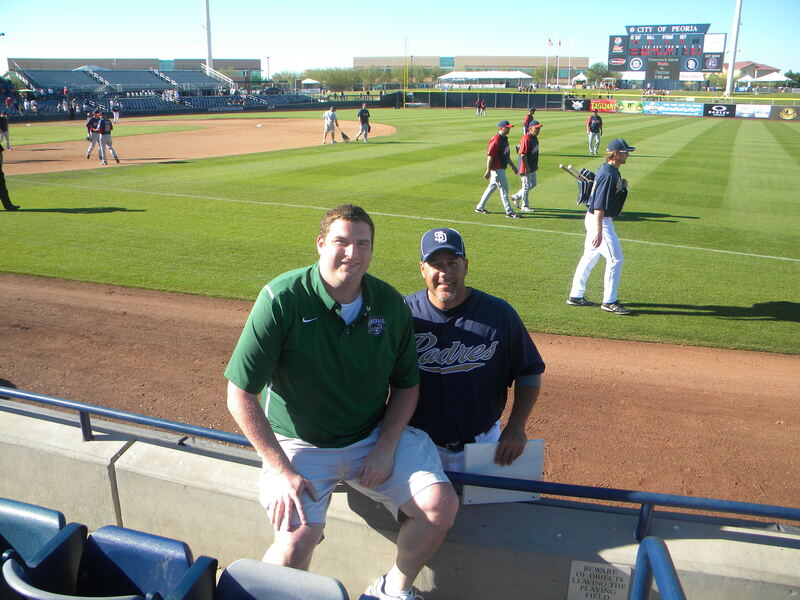 He is as big of a baseball fan as I am and it is fun to share the experience. Arrived around 2:30 Arizona time and got the rental car with no problem. (I know that probably burns Mike Curto up). The drive from Phoenix to Peoria is about 30 minutes and along the way you go through Glendale. 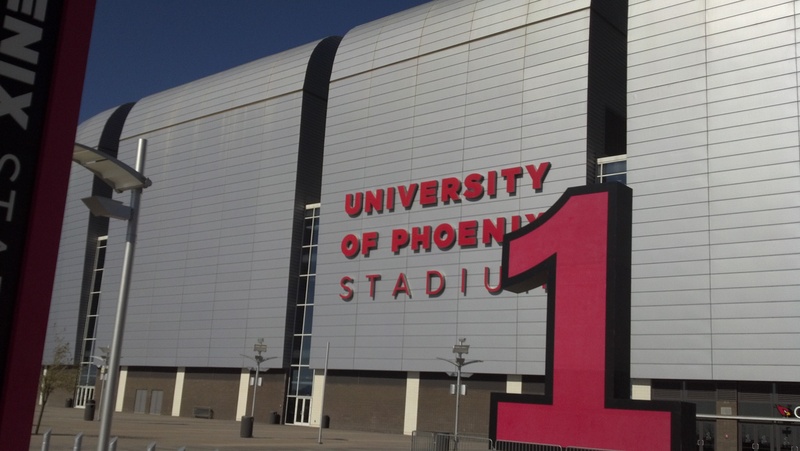 University of Phoenix Stadium, home of the Arizona Cardinals and Fiesta Bowl was on the right and looked like a huge space ship. I am sucker to just stop at random stadiums so we did. Made it to the Minor League Hotel and got checked in then headed over to the Sports Complex to pick up materials and credentials. All the fields were empty as the workouts were done for the day. But, had a chance to just walk around and check it out. Must admit, they indeed are like high school fields that are amazingly manicured with big league dimensions. Grabbed a bite to eat and noticed the Padres (they share the complex and stadium with the Mariners) were playing at home. They were taking on the Colorado Rockies and like the baseball nut I am, decided to walk over and watch a little bit of it. 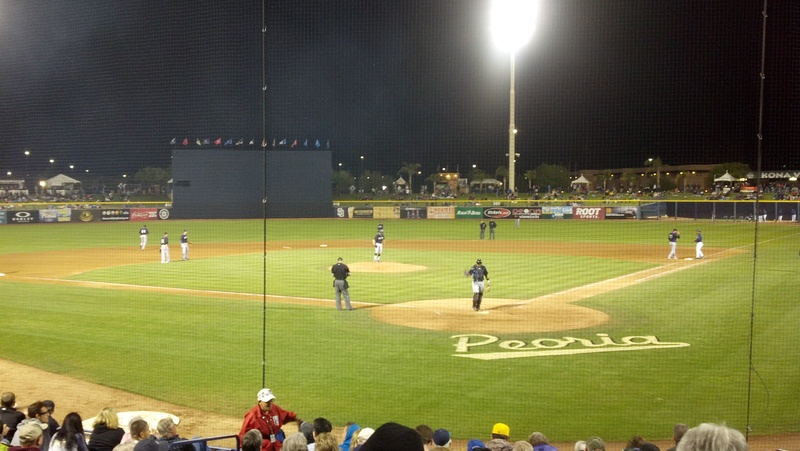 The Peoria Stadium is not as nice as I was expecting, but bigger than I expected. The average age in the crowd was around 65. The Rockies had more fans than the Padres ironically. Had a chance before the game to say hello to former Jackson Manager Phil Plantier. He was pretty shocked to see me, but went out of his way to talk to me. It was nice. Phil is now the hitting coach for the Padres and by the quick offensive outburst tonight with that team, seems to be doing a good job. That was the first spring game I have ever been too. The laid back atmosphere from players and coaches was interesting to watch. Also, a photographer went right behind the plate while a pitcher was warming up to get close ups. Coaches sit outside the dugout and players interract with fans between innings. Everyone that worked there was nice and seemed to love baseball. Below are a few pictures I took with my phone of the stadium. I (hopefully) will have some nice shots the next few days. Not that great with a camera honestly. Day two will be quite busy. Will head over to the complex around 9am. That seems to be when things will get rolling. Honestly don’t know what to expect, but that is the fun part of it. The Mariners host the White Sox at 1pm at the bigStadium. Going to take in the game from up top and hopefully give some nice commentary for Mariners fans. Tomorrow will be a fun experience. Going to take lots of pictures and get as much info as I can. Here is my outlook on what the Generals roster look like on opening day. I wrote a story in the local paper Monday on the recent cuts and some minor projections. You can read it HERE . This is a wild guess but I consider it a hypothesis. Harris’ Hypothesis! I will preface the projections by saying this. I am not in Arizona right now. Roster news in baseball is kept about as secret as President Obama’s cell phone number. So this is pretty much just for fun. If you are going to project a roster, why not make it exciting! I am more certain of Hultzen and Walker, not as much on Paxton. 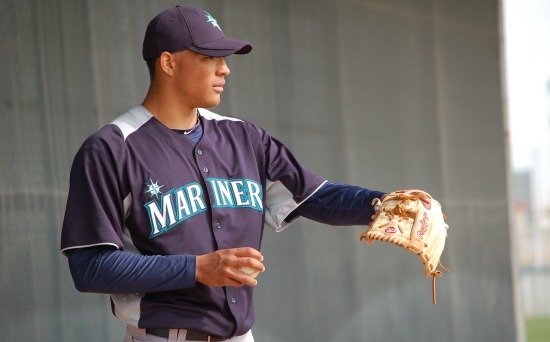 He only pitched 39 Double-A innings last year and with a cluster mess of arms in Tacoma. Why not let him come back where he is comfortable for a bit? Steven Hensley is an interesting case. He could very well be in the rotation, but due to his psyche, I think he gets a whirl in Triple-A maybe even the pen. I think once “the big three” make the move up you will see Kasparek, Stanton and Carraway get starts. By the way, I REALLY like Jandy Sena. We saw him for a few games in relief for Jackson last season and he was lights out. Big guy that throws hard and has nice secondary stuff. I like his chances to be in the Jackson rotation at some point. The bullpen situation is truly a crap shoot. I think there will be several cuts up high that will effect the Generals. 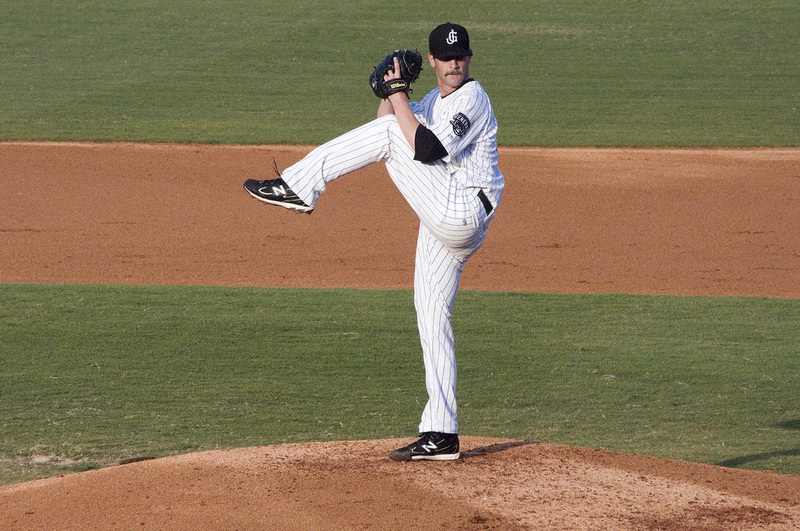 With Brian Moran’s great second half, does that lead him to a Triple-A assigment? I think he or LaFromboise start in Tacoma. I like Moran’s stuff better in the long run. Last year the Generals went two weeks with Brandon Bantz as their only catcher. The Mariners have more depth at catcher this year and even with the injury to Adam Moore, I think the two catchers return from last season. In the long run, can Steve Baron fullfill the hype and how long before they push the talented former Virginia catcher John Hicks. I like him better than any catcher in the system. Several AA veterans will be back in the infield. I do think there is a good chance Eric Campbell will be on the roster. Just not sure how things are going in spring training with him and what position they play him. Solid hitter and saw plenty of him with Mississippi and Carolina. This is a huge year for Tenbrink who has now been passed on the depth chart and will fight for PT. I think Scott Savastano could see time at second base. Or maybe Gabriel Noriega opens as the starter at second. Savastano had better numbers than Poythress last year. I think this will be a break out season for Nick Franklin. Cross your fingers that he stays healthy. He needs a rabbits foot in his spikes. His luck has been terrible. Chavez had a nice spring in big league camp and I hope it carries over. He struggled immensely last year. But, he does have the best outfield arm I have ever seen. Like Vlad Guerrero good. The Mariners have a decision to make with Joe Dunigan who has battled injuries the last few years. I see Daniel Carroll as the potential leadoff hitter if Brandon Haveman is not on the roster. Almonte struck out 161 times last year and 192 times the year before but he did drive in 97 runs last year in High Desert and with all the hype maybe they give him a shot. Below are archived interviews from this past weeks show on 96.5 ESPN in West Tennessee. R.C. Johnson came aboard in February of 1996 and immediately set forth in bringing U of M Tiger athletics into national prominence. Johnson spearheaded the Tigers move to the Big East Conference. He plans to retire in June.Over the last 15 years, the dynamic administrator has built Tiger Athletics into a nationally-recognized program that has participated in five bowl games and has competed in 14 post-season men’s basketball tournaments during his tenure. Under Johnson’s direction, donations to the department have risen steadily and more than $7 million has been raised each of the last three straight years. While he has already spearheaded two major capital campaigns that raised over $21 million in private funds for athletic department projects, Johnson announced in June 2011, a major capital campaign to directly benefit the Tiger Football program. The Vision for Victory, as it is billed, was developed to raise $10 million for a 74,000-square foot indoor practice facility, design upgrades for the current facility and the resurfacing of the current grass fields. Before taking over Tiger Athletics, Johnson was responsible for directing a Temple program with more than 500 student-athletes in 20 men’s and women’s intercollegiate sports, including nationally-visible programs in men’s basketball and football. He was named Temple’s director of athletics on May 9, 1994, after serving nearly six years as director of athletics at Miami (Ohio) University. He had also previously led the department at Eastern Illinois from 1980-88, and was the associate athletic director at Northern Iowa from 1974-80. 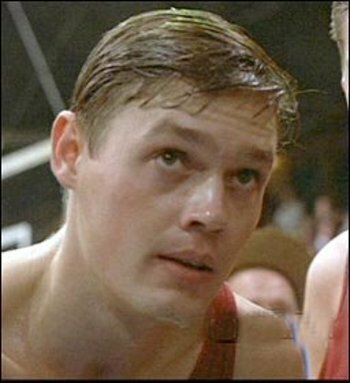 Bobby Plump is the player who hit the game winning shot for the Milan Indians in the 1954 Indiana state basketball tournament, which inspired the movie, Hoosiers (1986). He was invited to try out for the Minneapolis (now Los Angeles) Lakers. Operates a restaurant named Plump’s Last Shot, filled with memorabilia from the Milan 1954 state championship team, located in the Broad Ripple section of Indianapolis. Played for Butler University from 1955-58 (NCAA rules then limited players to three years of eligibility) and guided the Bulldogs to the National Invitation Tournament as a senior. He ended his career at BU as the school’s all time leading scorer. Played three years for Phillips 66 of the National Industrial Basketball League, now the National AAU Basketball League (NABL). Ran a life insurance company. Jason Smth is the beat writer for the University of Memphis basketball team, but it was his work in 2009 that had him on the show. Producers Dan Lindsay, T.J. Martin and Rich Middlemas drew inspiration from Commercial Appeal reporter Jason Smith. His 2009 story on a Manasass high school football player is what inspired the three to come to Memphis and film what would ultimately become the Oscar-winning documentary, “Undefeated.” Smith, one of the Commercial Appeal’s best reporters is featured quite a bit in the documentary. A Mississippi native, inspirational leader and one of the nation’s top rising coaches, Hugh Freeze was the first choice to return championships to Ole Miss Football and was introduced as the Rebels’ 37th head coach on December 5, 2011. Freeze, a noted speaker and recruiter throughout his career, has enjoyed success at nearly every coaching level over the past 18 years, from high school to NAIA to FBS, and each stop has featured a high scoring offense and the ability to motivate young people. The most recent stop for the former Ole Miss assistant was a record-setting run at Arkansas State. With Freeze as head coach in 2011, the Red Wolves captured the Sun Belt Conference championship and became just the third school in Sun Belt history to finish undefeated in league play with a perfect 8-0 mark. The 10-2 overall record marked the program’s first 10-win season since 1986, when ASU was a member of the I-AA Southland Conference. Prior to his arrival at Arkansas State, Freeze compiled a 20-5 record over the 2008 and 2009 seasons at the helm of the Lambuth University football program. Freeze was named the American Football Coaches Association’s Southeast Region Coach of the Year in 2009 after leading the Eagles to their best regular season in school history with an 11-0 record. Under Freeze’s direction, Lambuth won the Mid-South Conference West Division, advanced to the second round of the NAIA playoffs for the first time since 1999, finished the year with a 12-1 mark and ascended to the No. 6 ranking in NAIA.